Guaranteed to ship today if ordered within the next 2 hours and 49 minutes. 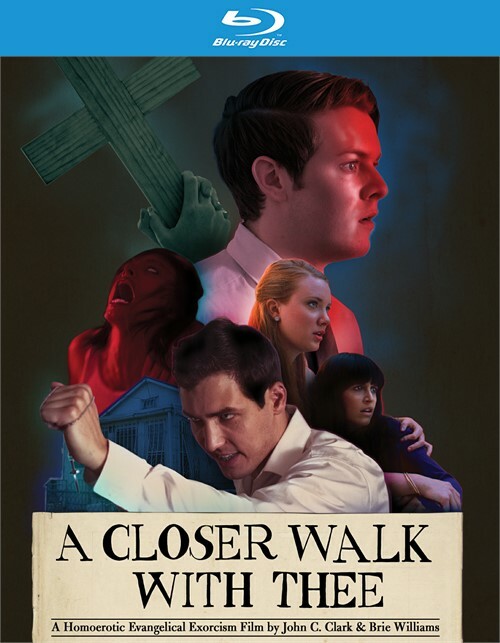 "A Closer Walk with Thee"
Four young Evangelical missionaries set up a house church in inner city Los Angeles with the idea of to try and save the neighborhood from a Satanist gang. Jordan, who is a good Christian kid, has begun to have impure sexual thoughts about his close friend and fellow missionary, Eli. He is outed when caught watching Eli shower and he is ostracized by the others. Eli, who is a fledgling exorcist, suggests that a demonic possession might be causing these Jordan's feelings and sure enough Jordan begins to behave as if he is possessed thus causing Eli to take action. However, what begins as a ritualistic method of trying to save their friendship spirals out of control and descends into darkness and violence. This is not a Christian film even though the title is misleading (but then so is religion often misleading? 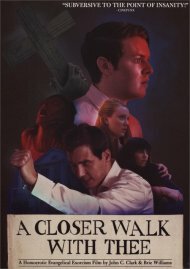 ).While "A Closer Walk With Thee" is very much about religion (particularly how fundamentalism in any religion is a bad thing), it is about religion's negative aspects. There are some real shockers here. Set in East Los Angeles, our Evangelical missionaries as they attempt to spread their unique form of Christianity in an area where they have no place being. Eli (Gregory Shelby) is the leader of the group. His father is the pastor who runs their church, and Eli has all the makings of a leader himself; he has everything going for him- looks, presence, commitment and Christian intellect (which is a bit different than just intellect- Christian intellect does not require common sense.) he's handsome, commanding, and hopelessly committed to 'the word', even at the cost of common sense. Lindsey (Kelsey Boze) is the straightforward one of the group; Kara (Megan Hensley) is uncertain and constantly scared of her environment; and Jordan (AJ Knight) is sweet, somewhat innocent, and desperately attracted to his friend, Eli. When Jordan is discovered engaging in less than reputable behavior in regards to Eli, the film begins its descent down dark roads (and, God forbid, there is a gay boy in it). While the subject matter of the plot is quite intense and occasionally subversive the strong line of dark humor that runs throughout as an undercurrent. We just need to think what kind of film we would have if we put fundamental Christianity in a gay themed film. We are really never sure how to react to what we see and hear on the screen. What some might cal, perverse, is rather tame here but shocking nonetheless. Undoubtedly, there will be discontented viewers but that is why we have theaters with doors and humans with legs. As I used to tell my students, leaving is easy; you put one foot in front of the other and go..
Directors John C. Clark and Brie Williams take on a controversial subject with abandon. This is obviously a very low budget affair but although we see only a few actors and a single set, nothing seems to be and it is witty and smart with good performances and a sensational plot. If there is a star, it is AJ Knight, who as Jordan has a difficult role. Even at the end, when Jordan is doing things that are seemingly crazy, he wins our empathy. I do have a little problem here however. While this film is about the wrongs of fundamentalism, I did not totally like its treatment of homosexuality. "Are we to see sexuality as a demon that waits for the right time to take control? People, in the past, saw it that way but those days are gone. There are also some violent depictions of the queer community that are not treated favorably". This is, most certainly, not a film for everyone. It deals with a difficult subject about which many have preconceived ideas but the film really crosses no lines (but then I am liberal and Jewish) even with its sickest scenes. To me, I got the feeling that the film is an examination of the 'white savior complex' and unless you belong there, you should stay away.